Standards of practice in veterinary medicine must evolve as new information becomes available, and diagnosis of heartworm disease is no exception. One of the primary functions of the American Heartworm Society (AHS) is to gather the latest information on heartworm diagnosis, prevention, and treatment in order to provide cutting-edge guidelines to veterinary professionals. In July 2014, the AHS revised its canine guidelines1 with changes that included important new recommendations regarding diagnostic testing. 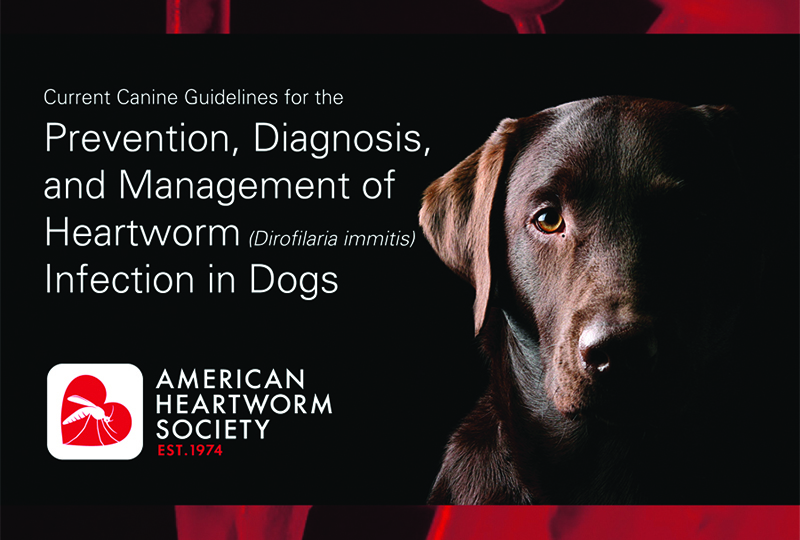 These guidelines—Current Canine Guidelines for the Prevention, Diagnosis, and Management of Heartworm (Dirofilaria immitis) Infections in Dogs—are available at heartwormsociety.org/images/pdf/2014-AHS-Canine-Guidelines.pdf. Options available to veterinarians for heartworm diagnosis have improved substantially since the AHS was founded in 1974. At that time, antigen tests were not available to the practitioner, leaving necropsy and chest radiography as the only strategies for diagnosing occult heartworm infections. Microwell-based tests became available in 1985, and although these tests are time-consuming, they remain the gold standard diagnostic for heartworm infection. Less complex in-clinic heartworm antigen tests were introduced in 1989 and, by the 1990s, these had greatly expanded options available for reliable in-house testing. Today’s heartworm antigen tests are highly sensitive and specific, making them extremely valuable to practitioners. Clinicians can often—although not always—detect infections with just 1 or 2 female worms. While a 1- or 2-worm infection cannot be differentiated from a 50-worm infection when an antigen test result is “positive,” any chronic canine heartworm infection, despite the number of worms, can lead to permanent damage to the pulmonary vasculature. This damage may not cause overt clinical signs, but reductions in circulatory and lung capacity can have long-term effects on the infected dog’s health. While antigen tests today are very good, they are not 100% sensitive. A “negative” dog can have a light worm burden or a circulating antigen level low enough to be undetectable. Rather than report a test result as negative, the preferable terminology is “no antigen detected” (NAD). This terminology requires explanation to clients who may assume that a negative test result means their pets are completely heartworm-free. We cannot, in reality, guarantee that. 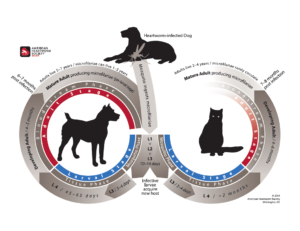 Understanding the heartworm life cycle (Figure) is necessary to properly time testing and interpret the results. The length of time between infection by the L3 larvae and the presence of detectable circulating antigen or circulating microfilaria varies, but generally this interval is believed to be about 7 months (antigenemia or microfilaremia may precede the other by a few weeks). Figure. Heartworm life cycle in dogs and cats. If a dog is switched from one preventive product to another, a similar testing protocol should be undertaken to establish which product was in use if a patient tests positive while receiving preventive medication. In a study presented by Susan Little, DVM, PhD, Diplomate ACVM (Parasitology), at the 2013 Triennial Heartworm Symposium,2 > 7.1% of infected shelter dogs tested negative on reference laboratory heartworm antigen tests due to apparent formation of antigen—antibody complexes. Dr. Little is working to establish a standard method for breaking down these complexes in order to increase the reliability of antigen testing. While heating of blood samples has been used to break down suspected complexes, the AHS guidelines do not recommend this protocol at this time. Draw a sample of venous blood into a syringe containing suitable anticoagulant (EDTA or heparin). Draw 1 to 2 mL of air into the syringe and mix the blood and anticoagulant immediately. Place 1 mL of blood in a 15-mL centrifuge tube; then add 10 mL of 2% formalin, insert stopper, and mix the contents by inverting and shaking. After waiting 2 to 3 minutes, centrifuge the tube for approximately 5 minutes; then invert the tube once to pour off the supernatant. Add 1 drop of 0.1% methylene blue to the sediment, mix contents, and transfer one drop of stained sediment to a slide under a cover slip for examination. Note: It is important to dilute the formalin properly; if the formalin solution is too strong, clumps of blood cells make slides unreadable. A 2% formalin solution contains 5.4 mL of stock 37% formaldehyde solution (ie, formalin) and 94.6 mL of distilled water. If using a 10% formalin solution, mix 100 mL of formalin with 400 mL of distilled water. Adapted from Bowman DD. Georgis’ Parasitology for Veterinarians, 10th ed. Philadelphia: Elsevier, 2014, p 346. While some dogs with heartworm infection may not have detectable levels of circulating heartworm antigen, it may be possible to detect microfilaria in this subset. Therefore, the AHS guidelines were amended in 2014 to include a recommendation for microfilaria testing in tandem with antigen testing. Heartworm prevention history is unknown. Microfilaria-positive dogs can further become infected, and may also infect other dogs in the household and neighborhood. Microfilaria testing is reasonable and even necessary; however, at a practical level, the additional testing increases the amount of technician time and client cost associated with each heartworm test. This is especially true if a microfilaria concentration test, such as a modified Knott’s test or filtration test—the most reliable means for detecting circulating microfilaria—is undertaken with each antigen test. A less technologically demanding, but reasonable alternative, is the direct smear, which requires examination of a blood drop under a coverslip for the presence of microfilaria. Although the direct smear is less sensitive than microfilaria concentration methods, a positive result on this test is a “true” positive. For step-by-step directions on performing a Knott’s test, see Stepwise Approach: Modified Knott’s Technique. The interpretation of conflicting test results requires thoughtful consideration. Both false-negative and false-positive results can occur. If a test result is unexpected, repeat the test with a kit from a different manufacturer. If the result remains unclear, independent confirmation by a reference laboratory is recommended to determine the result. A positive antigen test result should always be confirmed before treatment is pursued. In these patients, a positive diagnosis of Dirofilaria immitis must be sought, usually by sending a blood sample containing the microfilaria to a laboratory for identification. In rare cases, Acanthocheilonema reconditum, a non-pathogenic filarid, can be the cause of microfilaremia, and must be distinguished from dirofilariasis. Diagnostic imaging may help confirm the presence of heartworm disease. Use of these modalities is especially helpful in symptomatic patients. Echocardiographic visualization of large numbers of worms typically predicts a heavy worm burden, and associated greater likelihood of post-treatment complications. The need for appropriate adjunctive treatment measures and vigilance should be considered. For example, the use of doxycycline may reduce the severity of complications associated with treatment. See Doxycycline in the Management of Heartworm Disease (July/August 2012 issue), available at tvpjournal.com (Article Library). It is important to have a close partnership between the owner and the veterinarian throughout treatment, observing for early clinical signs of complications and performing serial chest radiography during frequent recheck examinations. Radiography alone, however, is not a totally reliable way to confirm diagnosis or predict post-treatment complications. A dog with a heavy worm burden may not be far enough along in the disease process to show significant radiographic changes, as these changes take time to develop. Moreover, many radiographic changes are permanent and persist even after most to all heartworms die. The AHS canine guidelines feature examples of radiographic and ultrasonographic images demonstrating heartworm disease abnormalities, including presence of heartworms in the right ventricle and proximal pulmonary artery. Antibodies potentially interfering with antigen tests. While convincing clients whose dogs are receiving a 12-month preventive regimen that annual testing is necessary may require considerable effort, the severe consequences of heartworm disease is worth the effort. American Heartworm Society. Current canine guidelines for the prevention, diagnosis and management of heartworm (Dirofilaria immitis) Infections in dogs, 2014, available at heartwormsociety.org. Little S, Munzing C, Heise SR, et al. Pre-treatment with heat facilitates detection of antigen of Dirofilaria immitis in canine samples. Vet Parasitol 2014; 16(203):250-252. Wallace E. Graham, DVM, is the immediate Past President of the American Heartworm Society and has previously served as Secretary-Treasurer and as a board member for AHS. He is an associate veterinarian at VCA Oso Creek Animal Hospital in Corpus Christi, Texas. He served in the U.S. Army’s Veterinary Corps upon receiving his DVM from Texas A&M University.